Cook the brown rice in boiling water for about 25 minutes, until soft yet firm. Drain. Top tip: you prepare the rice a day or two before then this meal can be thrown together in about five minutes! 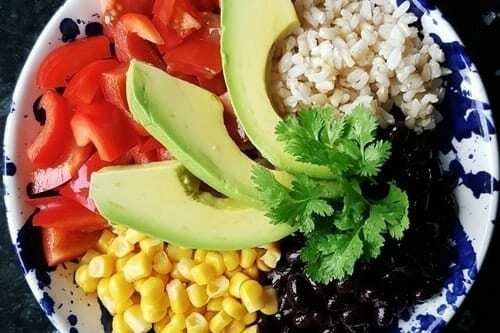 Arrange rice, chopped vegetables, drained beans and corn in two bowls. If you prefer this warm then heat in the microwave for two minutes - but it also taste great cool. Drizzle with lemon juice, top with avocado slices and coriander and enjoy!